Take a New Orleans helicopter flight! This kick-back aerial tour covers 15 miles of NOLA scenery cloud-level, so you can appreciate the city’s spirit from high above the bustle! 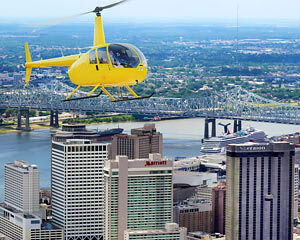 A helicopter flight over New Orleans is a great way to experience the city’s robust architecture. From the Creole cottages of the French Quarter and the Villas of the Garden district to the Plaza Tower and even the Mercedes Benz Superdome, the designs gracing NOLA are incredibly diverse, drawing their influences from many different cultures. Take a private, 15-minute New Orleans helicopter flight! See the colorful French Quarter and appreciate its melange of different styles! Soar over Jackson Square and observe its many eccentricities from above! Feast your eyes on 1,500 acres of rich greenery—travel far above the Spanish moss in City Park! Swoop over the Mercedes Benz Superdome! Snap countless photos while learning all about the city from your friendly pilot! Discovering the Big Easy just got a whole lot easier. Exploring New Orleans’s many neighborhoods from a helicopter is a rich history lesson and photo opportunity you’ll be glad you took! Book the sightseeing adventure now! Incredible exerperience. It was my first time on a helicopter and it was better than I ever expected. Even my boyfriend, who has been on helicopters before, was amazed at how smooth the ride was! The views were stunning! Stunning views of the French Quarter, Jackson Square and much more!